Use firm-ripe Bartlett pears for this cake. When you press the blossom end of the pear with your thumb, it should yield to gentle pressure. Softer pears will immediately turn to a watery purée if you try to grate them. This cake, and the apple variation that follow it, utilize the grated fruit as a means of retaining moisture in the baked cake. While each contributes a dimension of flavor to the cake, it's one that successfully blends with the seasonings to create a moist, harmonious finished product. Neither is anything like biting into a ripe pear or apple. Butter a 10-inch (16-cup) tube or Bundt pan. Coat it with the breadcrumbs, then spray it with vegetable cooking spray. Set a rack in the lower third of the oven and preheat the oven to 350 degrees. In a medium bowl, combine the flour, sugar, baking soda, salt, and spices, and whisk well to combine. In a large mixing bowl, whisk the eggs with the vanilla. Whisk in the oil, followed by the crystallized ginger. Use a large rubber spatula to stir in all the grated pears, followed by the dry ingredients, a third at a time. Pour the batter into the prepared pan and bake the cake until it is well risen and firm and the point of a paring knife inserted halfway between the side of the pan and the central tube emerges clean, about 65 to 75 minutes. Cool the cake in the pan for 5 minutes, then invert it onto a rack to cool completely. Cut into slices to serve, with the sweetened whipped cream if you like. Store the cake under a cake dome or covered with plastic wrap at room temperature. Double-wrap the cake and freeze it for longer storage. Defrost and bring to room temperature before serving. You may replace half of the vegetable oil with melted butter. 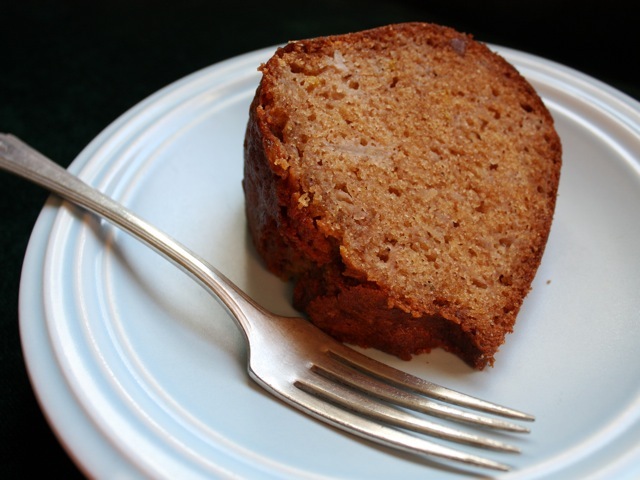 Variation: Apple Spice Cake. Replace the pears with peeled and grated Granny Smith apples. Omit the ground ginger and crystallized ginger and fold in 1 cup each of coarsely chopped walnut or pecan pieces and dark or golden raisins after the last of the dry ingredients. Culinate editor's notes: If you don't have fine dry breadcrumbs on hand, you can simply butter the pan and dust it with flour. If you need to grind your own breadcrumbs, do so in a food processor, then use the processor to grate the peeled, cored, and sliced pears.